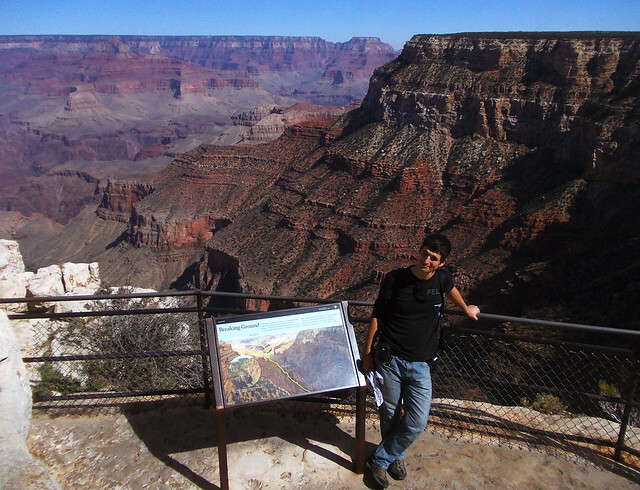 So finally you’ve decided which part of Grand Canyon you want to visit and the winner is South Rim – or not? Then Google further, it’s not the post for you. 😀 Or you can’t decide? This might give you some help. 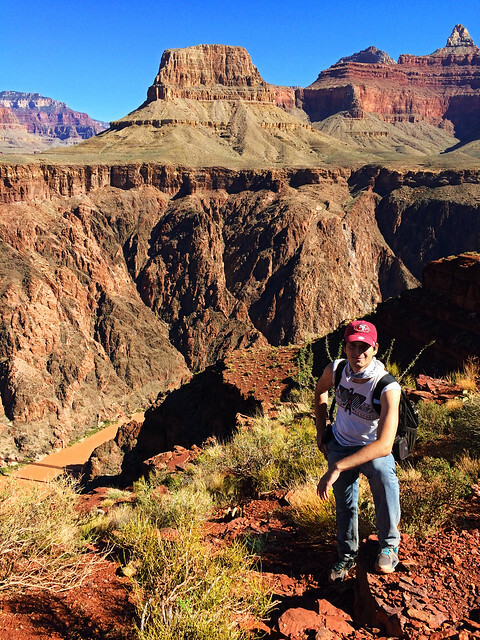 South Rim was our decision, too, because it seemed to be just the perfect place to get familiar with Grand Canyon: it’s easily accessible and it has very scenic day hikes. We’ve spent almost 3 days there – very long days, because we got up super early in order to be able to finish our planned hikes before sunset. But it was absolutely worth it! We started our exploration with Rim Trail. First of all, it’s the easiest trail with almost no elevation change, so it’s a perfect warm-up for the more difficult hikes. It’s also the most flexible route thanks to the shuttle bus which operates all along Rim Trail. And finally it offers fabulous panorama of Grand Canyon from above all the way! The shuttle bus stops at the vista points along Rim Trail, so you can choose to only walk around at the vista points, or you can hike a bit and then get on the bus to see the rest of the vista points. Or you can hike the Rim Trail to Hermits Rest (where it ends) and then get back to the trailhead by the shuttle bus. And this is a unique advantage of the Rim Trail over all the others: it offers astonishing panorama of the Grand Canyon to everyone. Seeing the majestic Grand Canyon from above is an unforgettable experience already, but if you are an adventurous kind then it doesn’t have to be the end of it. Getting down to the canyon is another very unique experience – and an exciting challenge, too! 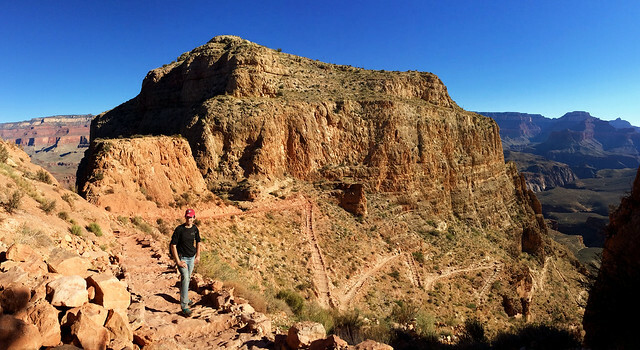 Bright Angel Trail is probably the South Rim’s most popular trail leading down to the canyon. 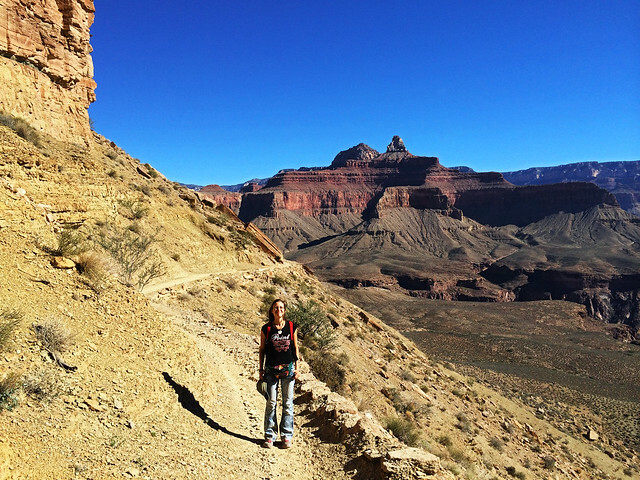 Now this is the trail where you can truly feel the size of Grand Canyon! It seemed huge from Rim Trail, but on Bright Angel Trail we just really felt how incredibly tiny we are. It’s quite a strenuous hike and depending on your physical condition you may choose to do only part of it. There’s two resthouses on the way down indicating a 3 and a 6 miles round-trip if you turn back there. As we continued we got down to a huge and almost plane plateau and reached the Indian Gardens which is a small oasis. From this point the trail was not so steep anymore and finally, we reached Plateau Point which is the recommended end of a day hike. We’ve spent an hour there relaxing, eating some snacks and wandering around – and taking pictures, of course. The panorama was amazing, the huge cliffs were all around us and we had a view of Colorado River, too! As they say: down is optional, up is mandatory! But Plateau Point is not so close to Colorado River as it seems. Hiking to the river and back in one day is officially not recommended and we totally agree. We don’t even have to think about all the health risks, but come on, hiking should be fun! Is it fun to force yourself to suffer all day just to say that you’ve done that (and there’s high chance you won’t…)? We don’t think so. Hiking back to the top took us almost double the time than hiking down to Plateau Point. Though the actual time needed for this hike could be different for everyone, the ‘double the time’-rule will be mostly true. We thought that Bright Angel Trail is very steep, but after we started South Kaibab the day after we quickly changed our opinion. 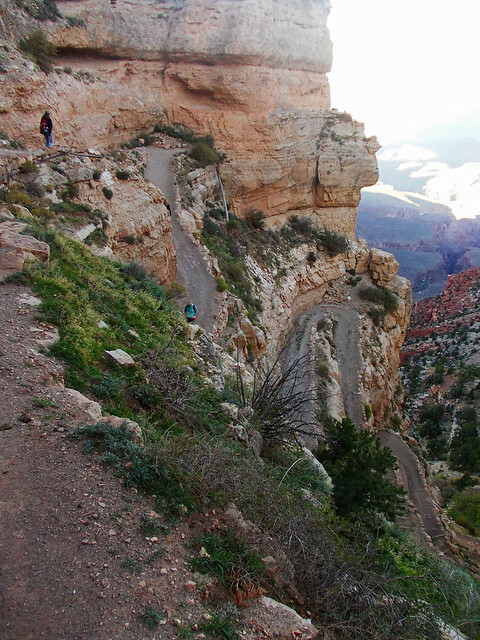 Bright Angel is steep, but South Kaibab is a very steep trail! Why have we done this hike in the first place if we’ve already been down there the day before? I think that’s the same question as asking someone why they want to see the sunset if they’ve already seen several sunsets. It’s just not the same. But we are not here to convince you about anything rather just telling you about our experience. We’ve done South Kaibab and we enjoyed it very much. We had astonishing panorama all the way and we found it even more dramatic than Bright Angel. We also found it less busy and steeper, so we got down quicker. 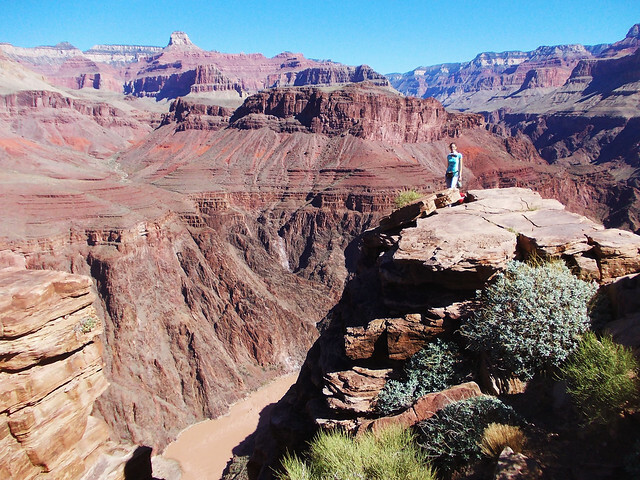 It’s very hard to decide which one we liked better – probably South Kaibab. We’ve reached Skeleton Point (the recommended end of a day hike) quite early in the morning and based on the general advice and our experience on the day before, we’ve ventured a bit further. We haven’t reached Colorado (far from that! ), but we got down to a plateau with quite a close view of the river and all the surrounding huge cliffs. We measured the time and it worked for us quite as well as the day before: double the time on our way back was what we needed. So calculating with this we knew when to turn back to be able to reach the top before sunset – and to have some rest stops on the way back, too. Because you should calculate with rest stops, believe us, you’ll need them. Grand Canyon South Rim is open year-round. But that doesn’t mean it’s not cold in winter. And there can be a lot of snow also. On the other hand, it’s very hot in summer. So our opinion is that the best time for hiking is spring and autumn. We’ve been there in October and the weather was just perfect – I mean during daytime. Because nights are already quite chilly in late autumn. But during the day we had pleasant weather for hiking. As always, we recommend you to check Grand Canyon NPS website for the latest weather, road and trail conditions. Usually we book our accommodation outside of the national parks, because there’s more and it’s cheaper. Grand Canyon was one of the exceptions where we booked a lodge in the park. The closest place to stay outside of the park is Flagstaff which is almost 2 hours drive. It’s fine if you plan to only explore a bit along the Rim Trail, but if you want to hike down to the canyon, you better start early in the morning. We wanted to avoid wasting time with driving and it turned out to be a very good decision, because we needed all day for Bright Angel and South Kaibab Trails. What else could we say? For us visiting South Rim was just a perfect start of a relationship with this astonishing wonder of the world. Grand Canyon, we already miss you dearly. Have you ever been to the Grand Canyon? Do you have a favorite hike there? Looks like so much fun! We’ve only been once, and it was very short. Can’t wait until we go back. Thanks for dropping by! We can imagine…. 🙂 We’ve spent there 3 days, but that seemed incredibly short, too! Thank you! this is very helpful! I will be visiting in October and your pictures and explanation really helped deciding a hike! Thank you for the post. I found it doing a little pre-trip research. Heading that way in a couple weeks and would like to get in a day hike or two while we’re there. Thanks for dropping by! 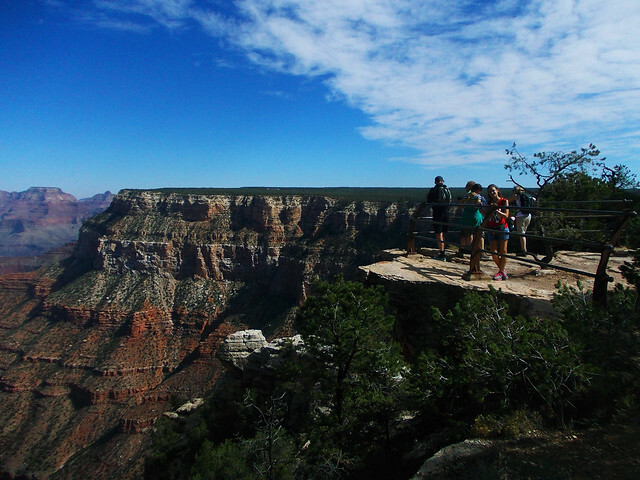 Grand Canyon really deserves its fame and we hope you’ll have a fabulous time there! I liked your article, its very informative. I recently visited Grand Canyon South Rim and did a 3 mile round hike by taking Bright Angels Trail. It was an amazing experience. You can check out my blog too about my experience. Thanks. 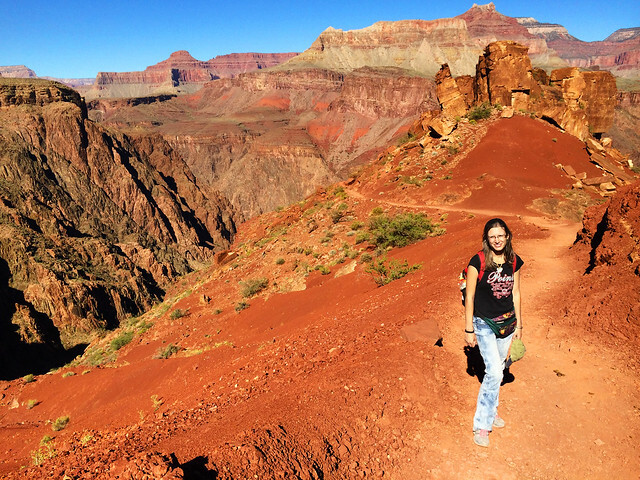 Hiking in Grand Canyon is surely an experience to cherish for a lifetime.